Alaska's Sarah Palin is stepping down as governor at the end of the month. For those of us who follow politics like rabid sports fans follow their favorite teams, this weekend's announcement by Sarah Palin was like a gift from the gods. As you undoubtedly know, the former Vice Presidential candidate, who's been in the national eye for all of about ten months or so, has just resigned as governor of Alaska - a full 18 months before her term officially ends. For those of us in the chattering class, this resignation definitely gets our mouths a-flappin'. Is she nuts? Is she just quitting? Does she want to spend more time with her kids? Is she getting ready for a presidential run? Is scandalous news about to hit? Did someone threaten her with something unless she quits? The pundits are going crazy. If you're a crazy conservative, then this is a sure sign she's thought it all through and gearing up for the 2012 run. If you're a looney liberal, this is uncontroversial proof that she's a quitter and not suitable for the job of dog-catcher, let alone President. But if you're a political sports fan, this is just good, clean fun. The fact is, we don't know. Yet. Clearly more will become apparent. But that doesn't mean we can't speculate, and that's what I'm going to do. First, let's eliminate the ‘nuts’ question. Despite the brittle cheerfulness shown in her resignation announcement, Sarah Palin still seems to be the same Sarah Palin we met last year. She's probably no more nuts than any other obscure politician would be if forced into the limelight overnight. But, like I said, we can't really know. Let's also eliminate the question of quitting to avoid bad news. Given her inconsistent record in Alaska, it's certainly possible there's more bad news coming down the pike and she's resigning to avoid it. But, at least for now, we don’t know for sure. Yet, at only 45 years old and possessing a brand awareness just slightly shy of Barack Obama’s, it seems terribly unlikely she's purposely squandering all that visibility in a sudden plunge to obscurity. No, what I want to explore is the question of a 2012 run. Not because I'd like to see her as President, but because I wouldn't. I think there are plenty of Republicans far more qualified to lead a troubled country, and our current President seems to be doing reasonably well given some very tough challenges. But, as a sports fan, I'd sure love to see her run. And it's here that Sarah Palin is fascinating. She’s a natural talent. I'm not talking about policy wonkishness, or even the ability to run a nation (or a state, or even a town for that matter). No, I'm talking about talent to captivate, hold attention, and work a crowd. Sarah Palin, for all her possible intellectual flaws, has some serious chops. Somehow she went from mayor of a tiny little town to governor of Alaska. If you've never been to Alaska, you don't understand just how amazing that is. Here's a former Miss Nobody who managed to defeat all the alpha dogs that the Alpha Dog State managed to toss against her and become governor. Talk about winning against all odds! And then, last August, John McCain gave Sarah Palin the biggest gift imaginable, which is a brand name. The world learned who Sarah Palin was overnight. Learned her hockey mom persona. Learned of her family. And the world learned that Sarah Palin seemed a lot like many of the moms, church goers, gun owners and ideological conservatives spread across America. But, like Harry Potter in the early books, she's an untrained talent. And that's probably why she's so erratic. She's never had the opportunity to inculcate herself with traditional political behavior, traditional political manners and traditional political mannerisms. She's just seen, wanted, and - by sheer force of personality and some amazing luck - transformed herself into an overnight celebrity. The problem for Sarah Palin isn't just Sarah Palin. And it's not even that some people love her, while others loathe her. No, her problem is she's out of the American mainstream and if her ambitions take her out of Alaska, it's going to be tough to execute on those ambitions while stuck 24/7 in a bad episode of Northern Exposure. Assuming she's not quitting because she's sick of it all, and assuming she's not quitting to run away from another impending legal shoe drop, let's just assume she's leaving office because she's had a taste of something bigger and it tasted oh, so good. In that scenario, what does staying Alaska's governor for another 18 months buy her? Or, put another way, what could it cost her? Well, she could make a governance misstep that could spoil her chances at a higher office. She could open herself up to more corruption charges. And, if she were to hunker down and just do her job, she could be out of the limelight long enough to lose some of the power of her current brand equity. But what does staying in office buy her? Well, those who hate her wouldn't get to call her "quitter". But they'd call her other things, so that's pretty much a wash. What else? Anyone? Anyone? Yeah, that's the thing. Staying in office in Alaska doesn't buy her very much at all. Even though Mitt Romney and Mike Huckabee both finished their terms as governor, most pro-Palin supporters won't bother to differentiate between one former governor and another by the length of his or her term in office. She'll be former governor Palin alongside former governor Huckabee and former governor Romney. And what does leaving office early buy her? Oh, so much. First, it gets her out of the line of fire if some other corruption charge is about to hit the fan in Alaska. But more important, it gets her into the mainstream and the mainland of the United States. It gives her the opportunity to say she'll miss Alaska, but she's staying in Virginia (or equivalent), for now at least. She could even leave First Dude and the offspring in Alaska, so they're out from underfoot while she's building a following. That’s Sarah Palin's core strength. She can build a following like only a few people in recent political history. Huckabee's charming (if a little nuts in his own right), but next to Palin, he's barely visible. Even Chuck Norris might be barely visible next to Palin's momma's-got-a-gun homespun naughtiness. And Romney? Romney's got mad skilz when it comes to finance, but his charisma comes in a can and is sprayed on before events. Romney will never be able to build a following anywhere near as large, enthusiastic, or vocal as Palin can - and she can do it overnight, with a mere wink and a smirk. Who else do the Republicans have? Ron Paul? Rudy? Newt? Next to the raw star power Palin has, those possible contenders fade into the background. So, in terms of star-power, if nothing else, she's got a chance. Leaving the Alaska gig early buys her time. It buys her the opportunity to go on a speaking tour down here in the Lower 48. That'll not only get her some cash to pay off her legal bills, but it'll put her in front of more and more people likely to support her. It buys her the opportunity to regularly meet with and court political backers and fundraisers, people who can make the rain necessary to give her the cash-money fuel to drive a 2012 campaign. It buys her the opportunity to travel abroad, meet leaders of other countries, be seen by TV cameras meeting leaders of other countries and - be seen by TV cameras drawing huge crowds in other countries. If she travels around the world, even if they don't think she should be America's leader, she's sure to draw a crowd because she puts on a great show - and because she's a great American curiosity. Leaving Alaska also buys her the opportunity to learn about America, so that she actually does seem smarter than a 5th grader when it comes time to run for an office in parts of the country that don't consider salmon slaying or helicopter hunting a pre-requisite for service. By all accounts, Sarah Palin is her own woman. She doesn't appear to take instruction well from others and her only really trusted policy adviser is a snow machine jock. But that unpredictability, that - dare I say it...maverickishness - is what makes her a wild card. Right now, it's anybody's guess what her real motivations are. But if she's going for the big prize, she's actually better served right now by not being Alaska's governor than being Alaska's governor. And while it's not clear she knows a lot about American policy issues, it is clear there's one thing she's an undisputed expert at: getting Sarah Palin what Sarah Palin wants. As a political sports fan, that's fascinating. As an American, well... to be honest, it does make the little hairs on the back of my neck stand up. No matter what, we haven't heard the last from Sarah Palin and it's going to be a heck of an interesting story. Whether she's more Jerry Springer, Jerry Brown - or Jerry Maguire (of "show me the money" fame) - only time will tell. I wish the United States had a mile high fence around it to keep out non-yankees. If you have a bad taste in your mouth, did you pull a Monica? Honestly, as a Poli-Sci and Language Major and 19 years old it is astonishing how badly our political system has developed into a shooting match. I give Sarah Palin the utmost respect for standing up to the perilous and vile critics who don't even do anything to benefit our country. It's a darn shame we still call ourselves a nation because we are so divided and willing to just point the finger and put the blame on anyone but ourselves and expect handouts from the government instead of working hard for ourselves. In general our society has lost sight of how lucky we are as Americans in my opinion and it's a shame that a kid has to point that out for some to realize it. Palin is a wonderful example of a woman who is hardworking and stands up for what she believes. She is a woman of her word and takes alot of persecution for it. As far as Andrea Mcleaod goes, she needs to stop the jealousy and persecution. If she looked in the mirror once in awhile she might see she should concentrate on herself and her intergrity. It is always easier to condemn another than pay attention to your own flaws. FAMILY should always come before anything in life. Alaska is not Palins God, it was her job and she is VERY good at it, despite the persecution. I am so excited for the day that this wonderful woman, Mrs. Palin, is the first Woman in the United States to become President. It is interesting that you only have people who speak out against Sarah Palin rather than presenting a balanced report. You might want to investigate exactly where the complaints have been coming from and report on that; honestly. Sarah Palin is a joke! She has NO idea what she is doing. She is so full of herself and delusional. Seriously America... who ARE these people blindly following her? I about fall over everytime I hear another story about her. Can't we just cut her off? Turn off her microphone! My 8 year old makes more sense when he speaks than she does. The people who ridicule Sarah Palin are very immature. Sure, opinions are given here, but any stupid person can have an opinion. The fact of the matter is that she does not care if it is political suicide or not-she even said so herself. She said she had a "higher calling". I believe that higher calling is to her family. What a travesty that our society is ok with ridiculing her family, but anyone else it wouldn't be okay. And shame on those who are in on it. What goes around comes around. Political suicide or not, one thing's for sure, there is a double standard going on around here and a witch hunt. With the frivolous lawsuits being thrown out, Andree McLeod should be paying back the state of Alaska for wasting taxpayer money. I noticed her resignation comes right after a news blogger doctors a picture of Sarah Palin and pastes Newt Gingrich's head on her son-now if that would have been Obama's children, there would be national outrage; instead people make fun of her by calling her a martyr. She probably said enough was enough when it came to her family. The hypocrisy of the liberal left is astounding. she can make a lot more money doing the speech/book rounds then she can as Governor of Alaska, and it looks like she is going to need that money to pay her legal fees since she will be fighting off trumped up legal charges for the rest of her political career...the democrats see her as a possible presidential candidate in the future so they are trying to destroy her early before she has any momentum. hand picked by Bush . Bring it on Sarah!!!! Just watched the interview with the major person involved in creating those idiotic lawsuits against Palin, Why wasn't some investigation done to find out whio is paying her to come up with these stupid lawsuits or why is she creating these doomed lawsuits and why it does not bother her that state money has to go to fight there lawsuits versus using these funds to do something constructive with the money. The real shame is the state money that has to be spend to fight lawsuits brought out by some idiot (probably a liberal idiot who thinks that this is some noble cause she is doing to prevent this evil person from moving up politically). Palin is never going to be President. It seems to be in line with the stupidity of the Letterman jokes. We should be focused on the trillions of debt that out new fearless leader is trying to sell. Or the Cap and Trade bill that will have governemnt telling us their requirements for us to sell a home. On Health Care – Congress needs to give up their sweet little private health care system and join the rest of us. Congress needs to eat their own cooking! So how much did Obama spend on his clothes and what about the cost of his wifes dresses??? Just have to bash Sarah and everything she does but make Obama a God. You will all see. Just wait till his term gets going good, you only will have your little selves to blame. Oh but you'll find a way to Blame Bush for that too! It's amazing how polarizing this person is and how slanted the coverage is against, her. If you were reporting on Michelle Obama or Hillary she would be canonized instead of crucified. It's all in the spin. I would imagine that there are multiple reasons she has been driven to this decision. She has exhibited more ethics and grace under fire then Hillary could ever dream of. Liberals seem to hate her because stands up for her values. Its even more irritating that she's attractive. I guess have to be gay or ugly to be influential. So lets see, we have an entire program for "Black in America 2" we have BET, we cheer the fact that Obama is the First Black American President. Wasn't MLK Jr that said "we should be judged for the content of our character and not the color of our skin?" Making a show out of Obama visiting Africa-give me a break! Are we going to have a show about being White in America? We go out of our way to be political correct-even to the ridiculous degree of Mirandizing prisoners of war. We live in a wacky world. Obama, Pelosi, Reid, Frank, Dodd et al – these people are a serious threat to the American way of life. Not because of their personalities and not because of the color of their skin, but because of their actions. Its time for reason to take over from special interest groups and influence pedaling-and that includes both Democrats and Republicans. Get a grip guys you've got a country to run. when are you all going to open your eyes, let Palin go off in the sunset, if she has what it takes she will be back. you really need to be thinking of what our great dem.& rep.politicians are going to screw up next, maybe just ask the lobbiest though, that is who is running our beloved govt. ever since our boarders were opened to free trade we have lost industry/jobs, and it has not slowed. we as a country are on the eve of a simple self distruct due to the lack of real statesmen in any of our representative positions in DC...we the people need to get off our kisters and show our congress we will not allow greed and self preservation in our govt......that is the real issue everyday we need to be spouting about. conservatives and liberals alike. Palin is smart, classy, responsible, and pretty. And, for whatever reason, that seems to piss off plenty of women. Why? Is it jealousy? Is her success intimidating? Does she not perfectly fit the mold? Shame on those people who preach that anyone can do anything and then kick the people trying every step of the way. America has forgotten the golden rule. I think Sarah made it quite clear and only a fool would not get the message. The cost of defending her good name had become a financial drain on the state not to mention the time and energy of numerous people whose expertise would be best served elswhere. The same fools who are trying to smear Sarah with the mantle of coward would, had she not resigned, be asking in the future why she had allowed the state to expend all the millions on her defence when she should have done the honourable thing and resigned. You people really are something you make a believer in God question the whole concept. Some of us really are created more equal ! After continuously being persecuted by that loony creature Mcleod, I am in total agreement with Sarah Palin's decision to quit. 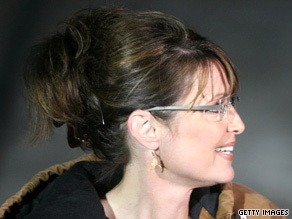 That woman obviously has some sort of "fatal attraction" with regard to Palin. There is a limit to how much one person should put up with just because they have been elected to public office. At this stage of the game, I believe she has doen all she could for Alaska as Governor. If anything, she will probably do more good for her state in another capacity. Give the woman a break. She has dealt successfully with many issues while raising a lovely family. She needs to go. She polarizes the nation. Republicans adore her Democrats cannot stand her. To me she represents an extreme set of racist and elitist philosophies that have no place in our society. It is scarey that she could have been VP of this great country. Maybe, the people filling these lawsuits need to be sued. What a waste of everyones money! I guess CNN likes to condone such acts. Dear Anderson, Enough with the Jackson stuff, your wasting your intelligence and ours ! You have informative news shows when you work at it. Please get on with what news that will help us, not bore us. She is the next Michael Jackson/Gosslin etc. Constantly having to reinvent herself to get attention. This is the new celebrity. No talent, no accomplishments. Just getting attention until you self destruct. The question should not what will she do next but how what will be demise... Divorce, death, scandal. It's so predictable and boring. What happen to real achievements? Where are our heros of today? Who should we really respect for their wisdom, leadership, accomplishments? Do we really want a Kate Gosslin running our country?????? For the love of God, would the media stop using tired cliches like "Been there, done that"? Please? How dare you Mr. David Gewirtz talk about a lady (Sarah Palin) that way. Are you best friend will Bill Maher? Borak Obama? The devil himself? Hold your stance.. and talk about Sarah Palin as if she’s a crazy nut, quitter. Hold your stance.. Hold it.. But we all know who is and who is going to be the real crazy quitter. Apologize Mr. I dearly hope that Sarah Palin simply disappears. But, alas, I know I'm not going to get my wish. Something is seriously wrong with vast numbers of members of the Republican party when they think incoherent and incompetent people like George Bush and Sarah Palin are some how capable of governing the country. I may of disagreed with his take on policy, but at least William F. Buckley had some intellectual heft. Bush and Palin have none. Sarah Palin is no Michael Jackson nor Princess Diana. These two were loved by millions for the impact they had on our society worldwide. Exactly what has Sarah Palin done...um....can't think of anything but work the media. Maybe, just maybe it really isn't anyone's business why she wants to stop being Governor of alaska. I really think you people are going way overboard on this. I say let's wait and see what she does, then if you must comment on that. and as far as her not being able to bet Obama in 2012, I say"Let's wait and see what kind of mess he has in 2 to 3 years." If he manages to get things back on track of course he will be re-elected, but if things continue to go down hill, and we get further and further in debt, because of his projects, than I wouldn't want to bet money on his re-election. I really can't believe you Obama supporters continue to bash her on a daily basis, but get your shorts all in a twist if anyone even says anything remotely negative aboout Obama. Turn-about is fair play my little HATE-BASHERS! WHY but you still do not get it. Maybe it's time to have Ms Palin write for SNL. Some of her comments are closer to that venue than getting to the White House. I am sure McCain's choice was because he didn't want to win and he was sure as soon as she opened her mouth it wasn't going to be an issue. Good Job John!! I have been thinking about her departure long and hard and remembered that Elisabeth Hasselbeck stumped for Palin in Florida and is expecting her 3rd child soon. Do you suppose that they have asked Sarah Palin to be on "The View" while Hasselbeck is on maternity leave? Then let her get a talk show on FOX News. We can only hope that the bad taste GW Bush left in our mouths from his 2 terms as president still linger fresh when Palin decides to run. I don't care how much she learns I just cannot bear to think of her as our main spokes person to the world – her with the flashy smile, the smirking, the convoluted answers to simple questions, the winks, etc. Palin needs to stay home in Alaska and talk to the snowmen – at least in doing that she doesn't make our country look anymore foolish and stupid than Bush did. Sarah Palin doesn't have a chance in hell of beating Barack Obama in 2012. She is definitely crazy if she thinks she can compete. In my opinion, Sarah Palin is kookie, condescending, and combative. Not exactly the qualities I look for in a presidential candidate.The woman can't even communicate her reasons for resigning her post as Governor of Alaska. Her spokesperson didn't even show up at her press conference. That says something. I'd say stop reporting about this kookie woman until she decides to make another PR move.
" Gift from the gods"??? All of you who seem to Hate Gov. Palin, can't help yourselves, you have to make nasty hate-filled remarks every chance you get. Maybe if you all would stop commenting on stories that CNN writes, maybe they would stop. Then maybe you all could go on with your happy little lives and find someone else to bad-mouth. How about we talk about Obama and Biden not undrstanding the mess they have. And this is okay with you Obama Supporters? You place all your faith in two men, who don't know their rearends from a hole in the ground. But, Gov. Palin according to you all is the stupid one. GO FIGURE! What we do know, is that she's dumber than Dan Quayle. That's how we like women in this country. Men won't feel threatened by her, women won't feel inferior. Michelle and Hillary could run laps around this doorknob, yet she'd probably beat them both in a head to head election. When she accepted the VP nomination, she knew she needed to bring her professional game up to another level, she never did. She knew that her family would get attacked as did Hilary and Chelsea before her (by even her twin maverick brother McCain in 1998), let face it she knew her family affairs would come out. But now she plays the victim card again, a card she played after those comical first extended interviews that we all enjoyed and SNL immortalized. But for the icing on the cake, she quits, because she does not want to be a lame duck governor, because the lawsuits keep coming, because it was the media’s fault, because seeing Russia from her house finally got to her, because its not fair that Alaskan’s paid her salary while she was running for the VP position, take your pick. So what does she tells us? Dear Mr. President, when things get tough, quit. Dear military men and women, if you are not having fun, quit. Dear son or daughter, if things are not going your way, quit. Sure, I agree when she first was introduced and gave a descent speech, sure the polls went up, but after the extended interviews, they went where they ended, down. She showed her true character, I real hope the book deal, Radio/ TV shows and the lecture circuits make up for what her party has lost by her actions. She may go down in history as the quitter that twittered. Do you not have anything else to report on? How about how well Barrack Obama's stimulis bill is doing? How about all the other bills he signed into law, how are they doing? How much control is the Government going to have over us when the Cap and Trade Bill passes? Why can't you report on something other than a dead guy and an ex-vice president nominee? Is this all you have? "Sarah Palin is rabib and totally a confused woman. She is another reason why ahe should help Pres. Obama in the health care issue. She can help push her many reasons for the bill like her daughter, etc. She should forget about being a presidential candidate. That would be like putting another GW BUSH in office. The difference is she would not have the money he has. Another wrecked economy"
i don't know what i am more sick of hearing about: michael jackson's death or sarah palin's resignation. whats this, the new paris hilton and linsey lohan stand-ins. Absolutely Vivien, she would do well in show biz! Move over Tina Fey! Quite frankly I hope that Sarah Palin is so much in love with her "Alaska" that she stays put up there. If she were to run for, much less win any office in the lower 48, the savvy Washington politicians would chew her up, spit her out & wipe their chins in a heartbeat. The farther North she is, the safer we all are, including Sarah. I saw how you cleverly mixed insults with your speculation. No big surprise there! Maybe she best fit as a VP candidate, but if she keeps her nose clean, draws the crowd without divisiveness, stirs up conservatism, and polishes herself a bit, she stands a real good chance one day for the highest position, not sure about 2012. Her motives in the governorship position were pure. Obama's time in the Senate WAS an intended part of the path to the White House. Who's the bigger patriot here? I love your article! and totally agree that Sarah has star-power to rival MIchael Jackson or Princes Di! She is an amazing celeb. But I think a career outside of politics, ie, running our country is out of the question. She should get a TV show and become the commentator she started out to be. For someone who claims not to like all this publicity, Palin certainly generates a lot of it for herself every day? In reality, she is no different from other Republican VP candidates like Cheney, Quayle and Agnew, designed and programmed to play to the Confederate-evangelical base of the party. Everything Palin did or said in the 2008 campaign was no different from any of these others. She is no better or worse than they were, and like them, appeals to no one outside the conservative base of their party.